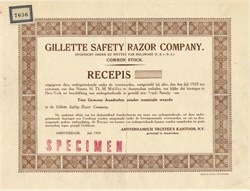 Beautiful engraved specimen certificate from the Gillette Safety Razor Company dated in 1929. This historic document was printed by Druk De Bussy Company and has an ornate border around it. This item is over 78 years old. Global Gillette is a business unit of Procter & Gamble. It is the successor of The Gillette Company, which was founded by King C. Gillette in 1901 as a safety razor manufacturer. It was based in Boston, Massachusetts. On October 1, 2005, The Gillette Company finalized its purchase by Procter & Gamble. As a result of this merger, the Gillette Company no longer exists. Its last day of market trading - symbol G on the New York Stock Exchange - was September 30, 2005. The merger created the world's largest personal care and household products company. Before the merger, Gillette had grown to become a leading global supplier of products under a variety of brands. In addition to Gillette, the company marketed under Braun, Duracell and Oral-B, among others. In July 2007, Global Gillette will be dissolved and incorporated into Procter & Gamble's other two main divisions, Procter & Gamble Beauty and Procter & Gamble Household Care. Gillette's brands and products will be divided between the two accordingly.